Dr. Georg Krause studied Business Administration at the Vienna University of Economics and Business Administration focussing Business Informatics. In 1992, he started his career at CSC (Ploenzke) as a management and IT consultant. He then worked in a senior position at the consulting companies Horváth & Partners, Steria Mummert and Deloitte Consulting. In 2012, he became business manager of SAP Austria, responsible for services / consulting business. 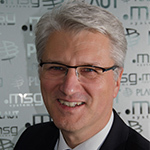 He worked for many years in the digital industry association "Internet Offensive Austria" as a board and managing director and is lecturer at the Danube University Krems. Since May 2017 he is CEO of Plaut AG and Managing Director of Plaut Consulting Austria.